In my head, I have written about 5 blog posts which have not actually seen the light of a computer screen. In my head, I am an awesome blogger. As soon as Mac or Google or some small start-up company develops that thought to text blogging patching for my smart phone, I am going to be amazing! After all that, this isn't really a full post either because I have dishes that need to be washed, clothes that need to be put away, a carpet that needs to be vacuumed and an apocalypse that has to be watched. What? My new obsession is Supernatural. Two seasons in one week... hence all the housework I need to do. I did, however, for the total of no readers of this blog who aren't my friends IRL want to let you know that I met Chris Hadfield yesterday. Luckily, I got all of this out of my system before I actually got to him. If you have no idea who I'm talking about, I am leaving this video here for your viewing pleasure. He was in Victoria signing his book so I lined up with my friends at a ridiculously early time for a Saturday and waited four hours for the signing to start. Cmdr. 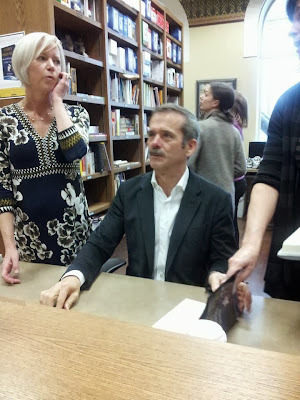 Hadfield shook hands with every person who came to get their book signed, asked everyone how they were doing, and seemed genuinely interested in our answers. That's my book he's about to sign. To fully drive home how excited this made me, I stopped in to see some friends on the way home and it took them 3 minutes to understand that I was saying "I shook hands with an astronaut!" Granted, English is not the first language of any of these friends but I think the inability to understand completely lies with my excitement level. It's 24 hours later and I'm still getting shaky just typing this. I feel like a six year old at Christmas! Copyright 2018 by Never The Cool Nerd. In other words, please ask before using my stuff. Simple theme. Powered by Blogger.